One of the most historic cities in California, Sacramento boasts an impressive array of landmarks, parks, amenities and other must-see points of interest. Here you’ll find a handful of our most iconic features to the City. California State Capitol…The Capitol building is home to the government of the state of California, house of the legislature and the office of the governor. A historic landmark with available public guided tours. Tower Bridge…A pedestrian, bicycle and vehicular traffic bridge that connects Sacramento and West Sacramento, the Tower Bridge is arguably one of the most iconic features for our city. Old Sacramento…Twenty-eight acres of Sacramento’s waterfront were home to some of the most influential history for the city. Due to past and current efforts by the State of California, private and public museums, individuals, business, the City and County of Sacramento, the Historic Old Sacramento Foundations, scores of volunteers, and many others, Old Sacramento lives on as thriving shopping and entertainment district as well as a global tourist destination. 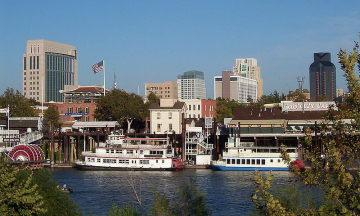 American and Sacramento Rivers …The city is situated at the confluence of the Sacramento and American Rivers, which give citizens a multitude of option for entertainment and lifestyle. Waterfront dining, boating, swimming and relaxation are just a few reasons why Sacramento residents love this city. Sutter’s Fort…A California Historic Park, Sutter’s Fort houses public tours and events that harken back to the days of the gold rush era. City Historic Cemetery…Adorned with beautiful statues, dramatic markers and lush gardens, Sacramento Historic City Cemetery is an outdoor museum recording California history from the Gold Rush Era through today. Guy A. West Memorial Bridge…An 1,100 foot pedestrian and bicycle bridge that spans that American River, and connects California State University, Sacramento to the northeast bank of the river. William Land Park…A sprawling, open space park that is more of a community in itself, than a single park, William Land Park is the largest in Sacramento. Its size boasts several neighborhoods, and has amenities such as a golf course, water features, picnic areas, proximity The Sacramento Zoo and Fairytale Town, and many more. McKinley Park …Just east of Business 80/ Hwy 99, McKinley Park is a downtown favorite for many residents. Play structures, open grass fields, running tracks, water features and tennis courts are just a few of the amenities of this classic Sacramento Park. Southside Park…Amenities at 19.9-acre Southside Park include a swimming pool, wading pool, three-quarter mile jogging trail, Southside Clubhouse, lake with fishing piers, accessible playground, par course with four fitness stations, amphitheater, and picnic areas. The Southside Community Garden is located one block from the park. Sacramento is the capital city of the U.S. state of California and the seat of government of Sacramento County. It is at the confluence of the Sacramento River and the American River in the northern portion of California’s expansive Central Valley. Sacramento is quickly becoming a hot spot for urban nightlife and an arts scene that rivals other cities and has exceptional cultural, artistic, and leisure opportunities that enrich the quality of life, contributing to a vibrant metropolitan region. Below you’ll find several great sources to dine, drink, soak in the arts, or just enjoy a day in sunny Sacramento.